patch. I don't feel comfortable putting everything online. One of the dangers of sewing is that family member sometimes volunteer your time and abilities, not realizing that there are different types of sewing. I spent two days doing something that should be easy, but of course I made it more difficult. Mr. Toad recently volunteered me to do some sewing for our son's scout troop. I was to make neckerchiefs for new scouts. This shouldn't be a big deal. The plan was to to make a template and mark the pressing lines. Since I have more than 10 yards of manila tag board--it is just like manila folders, but in a 4 foot wide roll--I thought this would be a very simple task. Ha! I was using Middle Son's neckerchief to make the template. I realized rather quickly that it wasn't symmetrical. Warning--I am going to use math speak, but for those who are not sure, I will try to explain. Please don't be insulted if you do understand. I am often surprised at how much I forget when I am not using what I have previously learned. I once was a math teacher so I was getting frustrated. This should have been a simple isosceles triangle--90°/45°/45°. Unfortunately, it looked like it was more of an 87°-ish and the other two were not equal. I found this out by using a protractor--the half circle with the little lines with numbers. So, out came the compass--the pointy thing that opens and has a place for a pencil. I began getting seriously geeky and my husband was telling me that this really didn't need to be so difficult. I was frustrated because this should have worked out easily. So, Mr. Toad took away my math tools and took out neckerchiefs he had from when he was a scout. He has a lot. He is an Eagle Scout and is part of our son's troop and was part of our Adult Son's troop. These had the same errors! What should have been a right (90°) angle, was about 85° on all of them. To make things worse the other angles which should have been 45° each (90+45+45=180--all the angles in a triangle always add up to 180°) These angles were off by more than 5° from each other. I decide to do it my way. 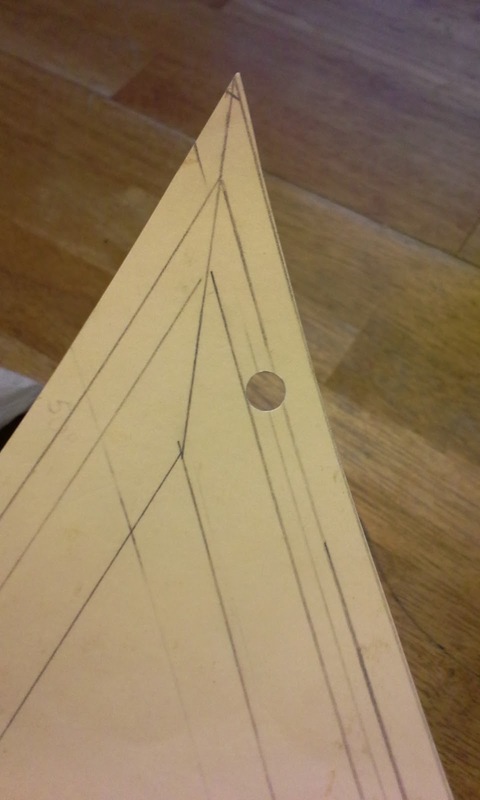 So, I constructed a triangle the old fashioned way and made adjustments. Ugh. It ended up being 85°/47.5°/47.5° on the tag board. The tag board had all kinds of erasers and marks. I made lines to mark how far to turn the fabric while pressing. I also added a hole so that I could hang it on a wire hanger (there is a use for those things!) in my sewing closet. turning and pressing the fabric. The hole is to hang it for storage. Once I had the template, I needed the fabric. I waited for Joann's to have a sale on their poly blend broadcloth and then bought 10 yards. I was using the same as what had previously been used. I normally would not have used this fabric, but having a non-bleeding non-ironing fabric for pre-teen and teen boys. I also had a 20% off on top of the sale price--yippee! I spent less than 20 dollars to make 25 plus neckerchiefs. Basically, the hardest work was making the template. 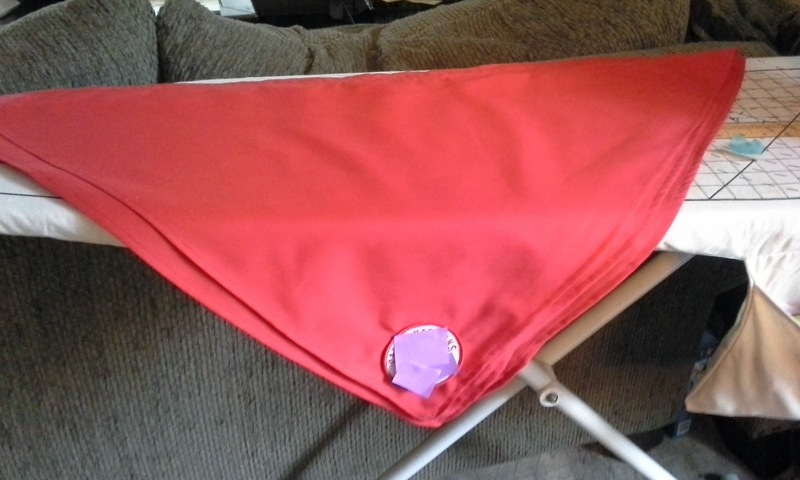 I now just need to layout the fabric, plop the template down and use the rotary cutter to cut. I do use a big ruler and add as much as I can to make them as big as possible while still having the fabric folded selvedge edge to selvedge edge. Because they aren't 90° there is a slight sliver of waste between. After cutting, just press, turn, press, stitch, press, add a patch. I really am annoyed at the fact that these are not 90°. It would be so much easier. I think that the shorter legs/sides would have turned and stitched a little easier if they had been on a true bias instead of a skewed bias. Oh, well. I need to deal with it and move on. I cut 12 today, but 2 had the ends cut off. I may be able to save them, but I would rather wait and see if they are needed. I will make more as needed, in quantities of at lease a half dozen. Vanessa over at Sew Filled To The Brim inspired me to make a sloper. She is using Vogue 1004 to draft her sloper. Since I have had the same Vogue sloper hiding in the back of one of my pattern boxes, I decided, with her egging me on, to also make one. But, since I have been wondering what the difference was between a commercial sloper pattern and one made from only one's measurements, I am also going to use either How to Make Sewing Patterns by Donald H. McHunn or Patternmaking for Fashion Design (5th Edition) by Helen Joseph-Armstrong. If you have a preference or experience with either of these two books, please let me know in comments. I am open to using either. Please excuse this very heavy affiliate link posting, but I wanted to show clarity without worrying about copyright issues and to make Amazon feel like I'm trying and not cancel my affiliation. Yay! Now I can track your progress too!! And btw, I totally understood all the geeky math talk! Thanks for taking me back to geometry! Vanessa, it will great to keep track of each other, or keep each other on track!